My first experience of Nintendo’s Style Savvy: Trendsetters was abject terror. As the game begins, my avatar stares wistfully through the window of a fashion boutique; it has some name like Stella Mia. The arriving owner of the shop senses my innate fashion passion, invites me inside and immediately gives me a job. She pushes me toward a customer ("Should be no problem for someone as well-dressed as you"), who says something like, "I'm looking for a girly base layer." A shelf full of clothing pops up. I freeze. The stakes were, in reality, probably pretty low. Most of the pieces I could have chosen would probably have satisfied her. I'm sure she would have happily let me keep showing her item after item until I found one that qualified. But this situation is one that I live some variation of every day, and in those cases, the stakes could not be higher. As a trans woman who grew up without ever being taught the thousand secret rules of performing femininity, I walk through life terrified that I'm wearing something the wrong way, this couldn't possibly go with that, I must look ridiculous wearing this outfit in this weather - no one else is wearing a long black dress and tights. Any detail could give away the game, could expose the facade of my femininity to reveal that I'm a Fake Woman. Possible repercussions range from micro-aggressions that will slowly but steadily erode my self-esteem to immediate physical violence. So when a tiny video game woman asked me to pick out a top that would look good on her, I panicked for a minute. She could not know, Nintendo could not have known, what it would mean to have a video game correct me on women's clothing. It wouldn't just mean I didn't know my fashion: It would call into question my entire relationship to womanhood. I eventually chose something, probably a camisole in the cream-to-pink range, and of course she loved it. "Wow, you've got a real eye for fashion," said my new supervisor. I remained on edge the next few requests ("I'd like some feminine shoes," "I could really use a pop outer layer"), but it soon becomes clear that there's a one-to-one relationship between the adjectives customers use to describe the styles they want and the handful of different clothing brands in the game. The words "pop," "feminine" and "girly" are all printed in a different color so you know they're Important Keywords -- match the keyword to the fashion label to win. "You're a real visionary," gushes the boutique owner, who I think is named Michaela. "I would love it if you could start working here full-time. I can tell you have a bright future ahead of you." For residents of the reputedly cut-throat fashion world, people in this game sure are nice. Later in the game, when you're running the boutique yourself, a representative from the local clothing depot will drop by to ask which brand she should next solicit for a stall in her building. When I pick the Raven Candle brand, with the gothic corsets and things like that (I need more black clothes in my virtual closet), she tells me, "We were just conferring about this and came to the exact same conclusion. I knew your knack for the latest styles wouldn't let me down." You can't help asking yourself: are these cisgender ladies patronizing me? Especially when that spectre of doubt plagues my every interaction with a style-savvy afab (Assigned Female at Birth) or cis woman friend. Compliment my shoes? Tell me my dress looks good? You're just saying that because I'm trans. You're trying to be nice. I show up to my video game fashion boutique wearing a green zebra-print top with a purple leather jacket and orange miniskirt and my customers rave about how well-dressed I am before begging me to find them a “boho-chic” outer layer. When you're a tall, fat trans lady, the game quickly becomes a wish-fulfilment engine. There's only one body type in the world of Style Savvy -- ultra-thin -- and everything fits it. For every piece of clothing you buy for your boutique, a "free sample" of the same piece is delivered to your home by a delivery bro who’s likeable despite himself, and who has an obvious crush on you. Soon you've got quite a wardrobe. The thought of wearing a whole new outfit each day, instead of just alternating between the same two outfits I currently feel comfortable leaving the house in, is an amazing escapist fantasy to me. At the intersection of trans and living below the poverty line lies a potent impostor syndrome. I make sure the same friend doesn't see me wear the same thing twice in a row, at least changing my shoes or a cardigan, lest my my gender be seen as a cheap disguise. Is that the only dress she owns? Games have always been an escape from that, offering an entire closet to choose from (and, often, a less dysphoric body to dress). From the kisekae games I played when I was little and not yet woman-identified to contemporary Flash dollmakers, these virtual paper dolls gave me permission to fantasize about what presenting femme might look like. I can still spend hours on dolldivine.com. Without these games, who knows if the me-I-used-to-be would have been able to imagine the me-I-am-now into existence? 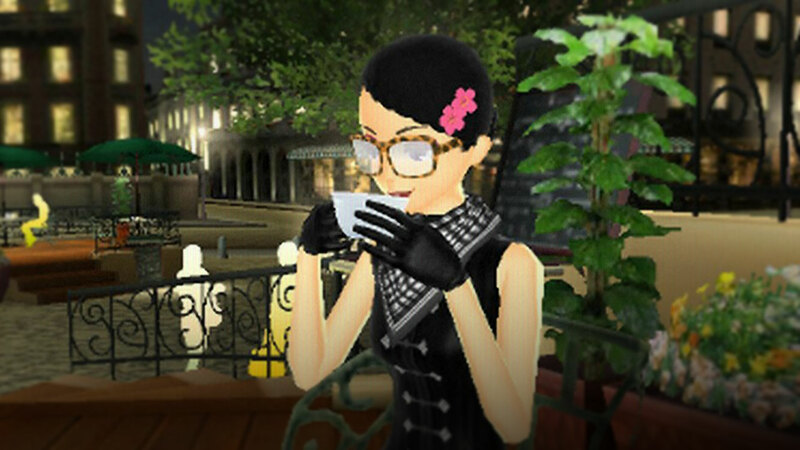 This is why I'm immediately drawn to any game that has avatar-editing, and Style Savvy is nothing but. I’m currently designing my own fashion game about chubby witches wearing magical clothes - at first it was a kisekae-style single-player game, then a multiplayer game with real paper dolls and Magic: the Gathering-style sorcerers' combat, and most recently it’s become a game about designing outfits and fighting over magical accessories. Now, it's going in a direction inspired more by the runway walk and ball culture, where players design and present outfits and take turns as judges, cutting down each other's creations. Those right there are the twin heads of the fashion beast: one is the liberation of endlessly reimagining ourselves, and the other is the swift social censure for imagining ourselves incorrectly. The customers I dress in Style Savvy -- all the same model with the features slightly changed, all the same woman- - don't laugh behind my back (did you see what she was wearing?). Or if they do, I haven't unlocked that mode yet. But for half an hour of my adult trans life, the threat of an imaginary cis woman raising a skeptical eyebrow at me was seriously scary. Almost as scary as that mother alien in Sesame Street 1 2 3 who shook her head at you when you got a math problem wrong. I was six years old, and I never picked up that game again.